OTR's editors and reporters utilize a well-established, thorough and efficient research methodology. Since 1995, the process has been refined and perfected to produce the industry’s highest-quality analysis and market intelligence. The efficiency of this system allows OTR to cover multiple industries and geographic regions. 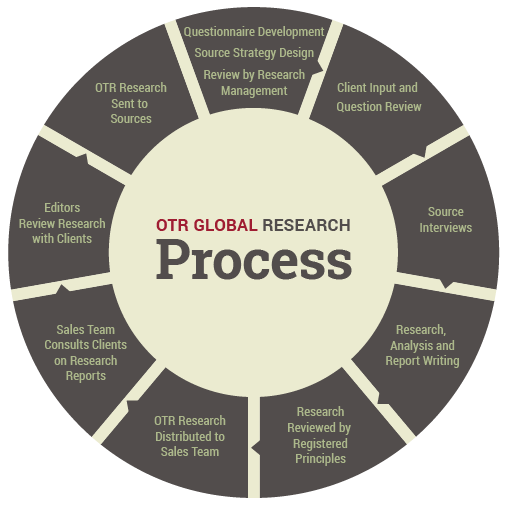 OTR’s research methodology is detailed below. As part of its ongoing methodology, OTR continually re-evaluates the topics it covers using quarterly data to emphasize or deemphasize (as the situation warrants) select coverage panels. Since OTR is NOT beholden to traditional industry coverage (SIC and NAICS Codes), the firm investigates industry ecosystems and focuses on the companies that really matter. Research reports are published quarterly, with notes, alerts, Snapshots and custom reports published between quarters. OTR’s research methodology also assures that its team follows all necessary compliance and regulatory requirements.